Oh my goodness, Marcus Smart. The 28-percent 3-point shooter is now 7 for 10, tying his career high. Wow, Olynyk scores inside and the Celtics have a 99-98 lead, their first since 6-5. Some confusion about whether Horford's shot was a 3 or a 2. Being reviewed. They've ruled that Horford's shot was a 3. So it's 103-102 Cavs. Horford scores inside to give cs a 3-point lead and then JR Smith drills one from the key. 106-106. Cs ball. 36.3 left. Al Horford with a short jumper and then J.R. Smith with a 3. Tied at 106. 36.3 left, BOS ball. Huge shot from Jerebko, but his foot was on the line. 108-106 Cs. 30.3 left. Cavs were unsettled that possession before Irving saved them with a nice drive. Tie game. Celtics ball and a chance to win it. 10.7 left. Kyrie Irving slashes for a layup. Tied at 108 with 10.7 left. BOS ball. Tied, 108-108. 10.7 seconds to go. Avery hits a 3-pointer with 0.1 left.. #Celtics win. 111-108. Wow. Wow. Bradley rolls in an open 3-from the left arc. Celtics 111, Cavs 108. Final. Crowd here is stunned. Celtics come back from 21 down. Game 5 Thursday at TD Garden. Bradley's shot hit the rim four times before rolling in. CLE was 2-for-17 from 3pt in the second half. Avery Bradley hit a 3-pointer with 0.01 seconds left to lift the Celtics to a 111-108 victory over the Cavaliers in Game 3 of their playoff series Sunday in Cleveland. Marcus Smart led the Celtics with 27 points and Bradley had 20. The Cavaliers, who led by 21 at one point, were led by Kyrie Irving's 29 and Kevin Love's 28. LeBron James was held to 11 points. Brad Stevens: “I really felt like in the first half we played way better than the score." Stevens: “Our defense was pretty good all night, and I know that sounds crazy." Stevens: "Yesterday was a bit tough. Today, we had our spirit back." "He’s the best player in the world. I’m not gonna criticize him one bit." What a bizarre Celtics fan week: Up, Down, Up. Sports, not Entertainment !!! Understand the difference. Smart: "We just told each other that no matter what happens, we’ve got to be the hardest-playing team." 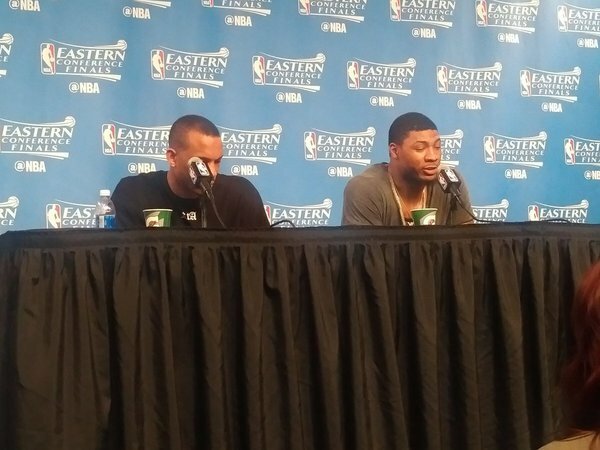 Avery Bradley: "For a team you could say is a young team, we came out here, and I feel like we matured tonight."